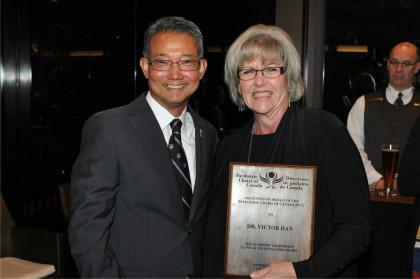 The Paediatric Chairs of Canada congratulate Dr. Victor Han as PCC's recipient of the 2012 Paediatric Academic Leadership - Clinician Investigator Award. Dr Han came to Canada for pediatric training in 1980 after medical training in Burma and Postgraduate training in the UK. He left to do a research fellowship in North Carolina and returned to London in 1986 as a neonatologist and perinatal researcher at Western University where he has been ever since. While continuing to practice as a Neonatologist, Dr. Han has been continuously funded for his research in fetal and placental growth and molecular mechanisms of preeclampsia. He was awarded a Canada Research Chair Perinatal Research in 2001. His CV indicates 140 peer-reviewed publications and many of them have high impact. His role as a mentor and builder is also legendary. He has been director of the Children's Health Research Institute where he has selflessly promoted inquiry into child health problems in all trainees. He has served on many national and international committees aimed at promoting child health research. he also served as Associate Dean of Resear5ch for the School. Two quotes from Dr Filler's nomination letter sums up how many people feel about Dr Han's contribution: "He is continually helping to establish linkages between basic scientists, clinician scientists and clinicians with the aim to optimize the sharing of ideas, skills and knowledge across different fields of expertise and to foster collaborative interdisciplinary working relationships" and "….has the unique ability to engage his learners while teaching even the most complex molecular mechanisms, while making linkages and highlighting relevance to clinical medicine."